A clone backup is an exact copy of a hard drive volume, and a bootable clone is an exact copy that can be used as a computer startup disk. Cloning is an important part of your backup plan, and is also useful when you want to upgrade your applications, system software or hard drive capacity. What is cloning good for? When you make an exact copy of an entire hard drive volume, you are creating a clone of the volume. A clone copy contains all files in the source volume, in the same configuration as the source. Typically the term ”clone” is used to describe a backup of the startup (boot) drive in a computer, since that is where the procedure is most valuable. Of course, it’s possible to clone a data-only drive, but in many cases, data is best copied in chunks, rather than as entire drives. Data clones are used in some video ingestion workflows, particularly for cameras that produce AVCHD-formatted movie files. It is not possible to make a true clone with the regular file copying tools in the operating system. It’s necessary to use a specialized piece of software (or command-line functions) to accomplish the cloning, since it involves the transfer of invisible files and ones that a user does not have permission to access. Cloning software is available for a very low price (or for free) on all platforms. In this page, we are using the term “Volume” to indicate a single partition on a hard drive. For many users, the terms Volume and Drive are nearly interchangeable, since many people have only one volume partition per drive. The video in Figure 1 shows how to make a clone using Carbon Copy Cloner. 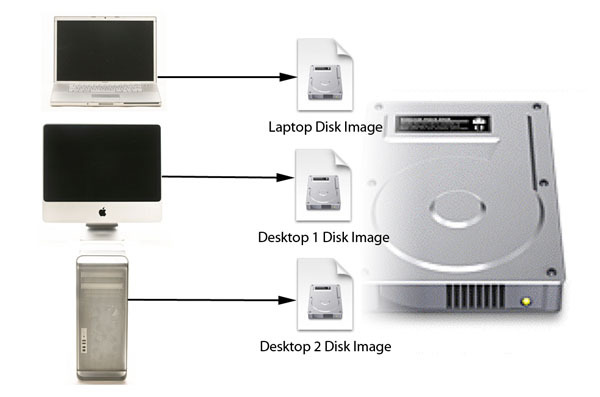 Figure 1 This movie shows you how to make and use hard drive clones on a Mac using Carbon Copy Cloner. The video in Figure 2 shows how to make a clone on PC using Shadow Copy Cloner. Figure 3 This video shows you some of the different uses for clones. A clone of your boot drive is an essential tool for recovery from a crash of your startup drive. Without a clone, recovery can take from a few hours to a few weeks, even if you have everything backed up. Your boot drive contains your operating system, your programs (typically), and many updates, user settings, passwords, software customizations, and more. Even if you have all your programs on readily-available optical disc, it can take days to reload, update and configure everything. If you have an up-to-date bootable clone, it may take you only a matter of minutes to swap hard drives and be back in business. Every now and then, the upgrade of the operating system or a critical application goes horribly awry, and your computer may no longer perform vital functions. Sometimes this is because a vital piece of hardware is not supported by the new OS or program. Sometimes a program may be incompatible with the new OS. And sometimes the upgrade of the OS may simply fail, rendering the computer unusable. Once again, if you have a clone of the system made immediately prior to the upgrade, it can be quick and simple to return to the properly functioning configuration. This is particularly important for laptop computer users. Drive capacity is increasing at a rapid pace, and cloning can help you upgrade your internal drive cheaply and quickly. In most cases, it’s as simple as cloning from the existing internal drive to a newer one in an external enclosure. Once that’s done, simply swap the drive into the internal drive bay in the computer and restart. Over time, a boot drive can become clogged up with registry problems, invisible background applications, junkware and other malware that can really slow it down. (This is typically more of a problem on Windows than on Mac.) Some people like to create a clone of a freshly installed and configured system, and do a periodic format and clone to their boot drive, in order to get back to a leaner and faster computing experience. This is a particularly popular method for people who administer classroom computers, company-wide systems or anywhere else where multiple computers share identical configurations. Often these clones are compressed rather than bootable clones. Figure 4 A compressed clone saves all the files from the source volume into a single file. To make use of the clone, it must be restored to a separate hard drive. There are two principle advantages of a compressed clone. It may not require its own dedicated volume. This means that the clone can live on a single hard drive volume along with other files, if you choose. This can be desirable if you need to make a clone backup of more than one computer, or if you want to store the clone on a drive along with other kinds of backup files. It may be easier to determine that the compressed file remains uncorrupted It will often have its own checksum to verify integrity, and it may be harder for malware to sneak in undetected to a compressed file. There are some significant disadvantages to a compressed clone, particularly related to the speed of recovery and restoration. It is time-consuming to decompress a clone, which can be a real inconvenience if the restoration must take place quickly. You need an additional drive to restore to. If you are on location, this means you need to have both the compressed clone and an additional drive if you were to try do a restoration in the field. Compressed clones may be written in a proprietary format that must be decompressed by the program that created the clone. Compressed clones may not be easily updateable with changes that are made to the source volume. There are some compressed clone formats that are supported at a system level. When using a tool to make compressed backups, we recommend using one that makes use of OS-supported formats, rather than proprietary ones. This allows for more universal access to the backup file, and provides the option to make the backup run faster. On Mac, this is the sparseimage format. On Windows, it’s called VHD. In both sparseimage and VHD, all the free space on the drive is essentially squeezed out, leaving only the files. This makes the clone take up less space than a full bootable clone, although it may require more storage space than a proprietary compression scheme. Because all the files are written to these formats intact, files can be extracted or updated without running a decompression routine. This means the files are more easily accessible and updatable. Of course, it also means that there is not a lot of real compression, compared to some of the proprietary formats. If you are going to use compressed clones, class="trademark">® recommends that you use software that creates these OS-supported disk images. Figure 5 A bootable clone makes a copy of each file on the source volume, in an identical configuration. It’s the fastest way to get up and running after a drive crash. In most cases, the only tool required for the drive swap is a screwdriver. Mac users can also boot directly from the clone, without having to swap it into an internal drive bay. It’s the easiest way to offer very good protection for current files on your boot drive. It’s economical, only requiring a single additional drive to accomplish. There is no need for special proprietary software to make use of the clone. It’s the fastest and easiest way to upgrade the capacity of your boot drive. It offers easy rollback to a previous software or OS, if the clone is updated immediately before the OS or application upgrade. There are relatively few disadvantages to creating bootable clones. In order to make clone backups of more than one computer to a single hard drive, the drive must first be partitioned into one volume for each source volume. Your current software might not support it, and that may require the purchase of an additional software package. A bootable clone is slightly more susceptible to corruption or virus than a compressed version. It may take marginally more drive space than a compressed clone. Figure 6 Clones can be made by copying individual files or by copying the data directly from the drive sectors. Only file-based cloning lets you copy to a larger drive as part of the cloning process. Nearly all Mac clone software works on a file basis, and can make a clone to any drive with enough open room for the files. On Windows, a significant number of the available cloning applications use the sector method. If you are going to buy a piece of software to run your cloning, make sure it is capable of file-based cloning. 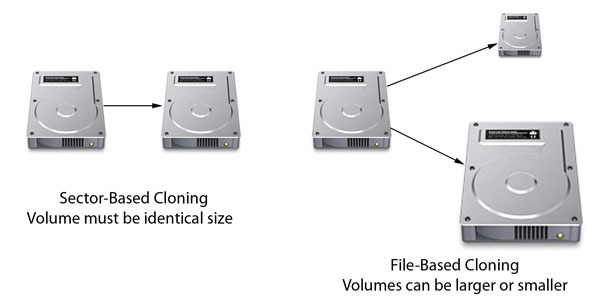 A clone is a snapshot of a volume at the time of cloning. For most users, as soon as the clone has been made, it starts to become out-of-date, as files are changed or added. The methods for keeping clones up-to-date typically depend on the clone type. One update method is to run a full backup again, but this is unnecessarily time-consuming. If the software is designed properly, only new and modified files should need copying, which can greatly reduce the time required to update the backup. There are two methods for updating bootable clones, besides a full backup. You can make a differential backup or a differential backup with archive. If you have a bootable clone, your software should perform a differential backup, copying all new and modified files from the source volume to the clone. In the most basic arrangement, new files are added, modified files are overwritten with newer versions, and files that have been deleted from the source are deleted form the clone. Figure 7 diagrams how this works. Figure 7 A differential backup automatically copies new and modified files from the source to the clone. Your software will also probably offer the option to create an archive of the modified or deleted files, instead of deleting them immediately, as shown in Figure 8. This prevents the clone operation from accidentally throwing out files that have been modified or deleted inadvertently. Of course the archive of these files is limited by the space available on the clone drive. Figure 8 You can set most backup software to save a copy of deleted and modified files in a separate folder on the clone. While this can possibly save mistakenly deleted files, it can also cause problems. Make sure that the archived files don’t outgrow the space available. Support for incremental backups in compressed cloning software is hit or miss. For sparseimage and VHD as outlined above, it’s possible to make a differential backup and a differential backup with archive. TIme Machine is a backup utility that is incorporated into the Mac OS X operating system since version 10.5 (Leopard). It provides a very simple solution for complete system backup and recovery, including the ability to roll back your boot drive to many specific points in the past. Time machine can be an excellent tool to backup your entire boot drive, but will not be appropriate for all users. The rollback feature may allow you to find and open older versions of your documents, and even ones that may have been deleted from the primary drive. Time Machine creates hourly backups for the most recent 24 hours. It also saves daily backups for the past month and weekly backups for everything older than a month. Backups are stored until the volume runs out of space. Time Machine will automatically purge old backup files to make room for newer ones. Unlike many backup utilities which save delta versions (only what’s changed in a file), Time Machine backs up entire files. This means that you can browse the backups using the Time Machine application or just browse the volume at the Finder level. When using the software application, the user can view their entire catalog as a snapshot of its current state at a particular time. This makes it very easy to locate files that had been incrementally backed up. The software works via a connected disk, a networked volume, or Apple’s Time Capsule (a wireless backup station). Time Machine has some important limitations – ones that fall pretty hard on photographers and videographers. Time Machine only backs up your boot drive, and does not back up any secondary drives connected to your computer. You can’t boot off a TIme Machine backup without first running a restoration. A full restoration from Time Machine can take many hours to run. Time Machine does not work well with Lightroom – it can fail to produce a viable backup if it runs while Lightroom is open, and a large Lightroom catalog will make Time Machine run slowly. Time Machine is valuable if it is used for what it does well. Here are some tips. Time Machine should be considered a tool to back up your operating system, programs, email, text and non-media data. Exclude Lightroom and Aperture catalogs and image files from the Time Machine backup. Create at least one clone backup, in addition to your Time Machine backup. There are many different ways that clones can be used to protect your data. Choosing the right system depends on how your computer is configured, how valuable your data is, your travel requirements, and how many computers you need to protect. The following examples outline some common system configurations used by photographers and videographers. For the purposes of this exercise, we won’t cover the backup of image data as a separate task, although that is probably a good practice for most photographers. Let’s start by looking at the simplest system to protect: a laptop computer where all the data lives on the internal drive. This might be a computer used for imaging, or it might be a computer used for email, billing and other communication tasks. 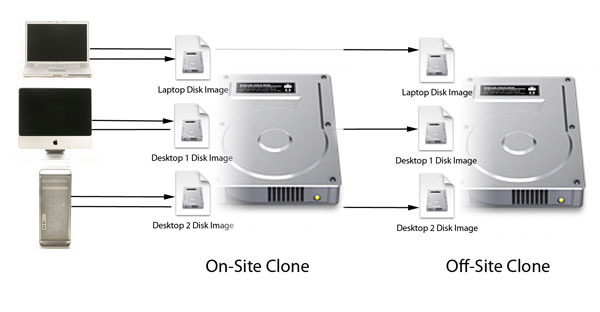 A single computer can be very well protected by using two clones – the on-site one lives near the computer and can be updated regularly. This provides protection for new files, particularly against hard drive failure. The second clone should live off-site, and provides protection against total loss of the system and Clone 1 (such as through fire or theft). Ideally, the on-site backup gets updated frequently, to maximize the protection of recent work. The off-site backup should get updated as often as is practical. ￼Figure 9 With two clones, you can protect your laptop very well. 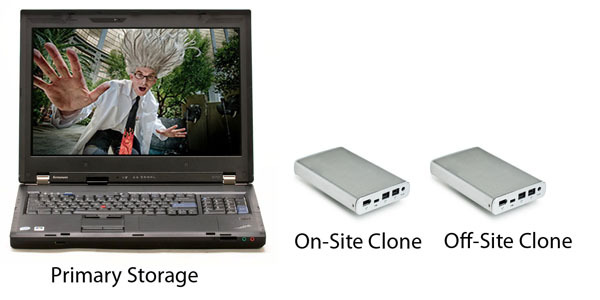 The on-site clone can be updated regularly, protecting recent work against drive failure. The off-site clone lets you get up and running again in the event of a total loss of the studio computers. If you do location work, and are really serious about protecting your data, you probably want to add a third clone to the mix. One clone lives on-site, one lives off-site, and one can live in the bag with the laptop, and travel with you. This can provide backup of files that are created on location, and can provide a bootable backup in case the drive fails while you are in the field. ￼Figure 10 Location shooters will also want to consider making a clone and taking it with the computer in case the laptop’s drive fails in the field. The clone protects recent work, and can be used as a startup disk if the internal drive fails in the field. It’s very common for a photo or video studio to have more than one computer, and the need for clone backups can start to become complicated. Here’s one scenario for making that more economical. Note that in a multi-computer setup, it’s typically even more important to treat the image/video data backup differently than the boot drive backup. In this example we will assume that we are making a boot backup only, and that the data is being backed up by another method. If you have multiple computers to back up, then it may be easier to use compressed backups in order to reduce the number of backup drives needed, as shown in Figure 11. One large hard drive can hold multiple volumes, cutting down on expense, storage space, and weight. While it’s possible to split the clone backup drive into partitions for each volume you want to clone, that locks down your space allocation for each volume. If one volume were to outgrow its partition, you’d need to format the device and start all over. ￼Figure 11 You can save multiple compressed clone backups to a single backup device to make the clone process less expensive and more streamlined. If all your clones won’t fit on a single drive, you can also use a drive spanning device like a RAID or Drobo to host the clones. Figure 12 You can make a multi-computer backup to store off-site as well. Do different computers need different protection? It’s quite likely that different computers will require different levels of clone backup protection. How often does the boot drive change? A boot/program drive on an imaging workstation may be a very stable volume, only changing when the operating system is upgraded, or when programs are installed or upgraded. A computer like this may only need to have the clone updated before and after each significant upgrade. You’ll want to update before the upgrade, in case something goes wrong and you need to roll back. Once you determine that the upgrade is problem-free, you’ll want to update the clone with the new configuration. A laptop that is used for field downloading, client communication and billing should be updated much more frequently. You’ll probably want to update the clone very regularly – even daily – unless you use some other tool to back up your works-in-progress on that machine. You’ll want to run the clone before and after each upgrade, as outlined above. How much risk is the computer exposed to? Once again, there may be significant difference between different computers you use. A workstation locked in a secure building has much less exposure to fire or theft. A laptop used for location work is considerably more vulnerable. 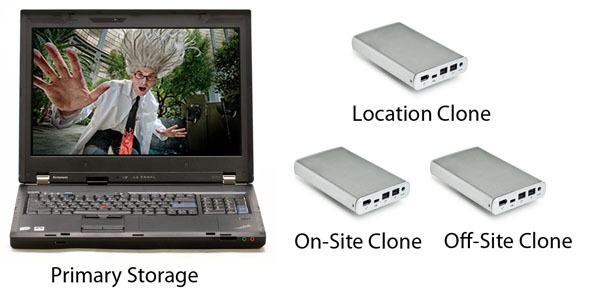 dpBestflow® recommends that people who take laptops on location should strongly consider the three-clone backup system for their location computers. Figure 13 outlines how cloning could work for a system with different levels of risk for different computers. ￼Figure 13 If one of your computers goes on location, it should probably also have a location clone backup.